Click on "Who Am I" to begin and answer questions about what you look like, your pets, toys and more. Click on the arrow button to go to the next scene and to continue to the next topic once you reach the end. Can you choose foods to make a healthy meal? Click on "List Your Favorite Things for Zorro", or choose another doodle page. This delightful sticker book helps young children talk about their lives through topics such as friends, family, food and feelings. 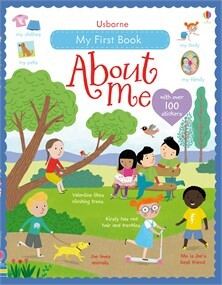 Each double page introduces children to a different topic, including My body, What I can do, What am I good at?, and Growing and changing. With simple activities and over 100 stickers to complete the pages.